NEW DELHI, India (April 10, 2017)— Celebrating three years of fulfilling the Dream of owning Accessible mobility and building Trust with its valued customers, Datsun today announced the launch of Special Anniversary limited editions of Datsun GO, priced at INR 4.19 Lakh (ex-showroom, Delhi) and Datsun GO+ at INR 4.9 Lakh (ex-showroom, Delhi). The anniversary editions of GO and GO+ comes with a first-in-segment Ambient Lighting app for mobile phones with which a customer can choose the mood lighting of the car’s cabin to suit his or her taste. Coupled with eye-catching body graphics, a unique Anniversary Edition badge, and a sporty black rear spoiler on the exterior, the interior features vivid blue inlays on the passenger seats that match the blue trim around the centre console. Additionally, anniversary floor mats, art leather seats, a keyless entry system, Bluetooth connectivity, rear parking sensor, radio and USB connection features all culminate to add flair and convenience to the interior space. As part of the celebration marking its three great years of existence in India, Datsun India will run a social media campaign that invites existing customers to share their interesting stories of family times involving their Datsun vehicles under the #UnitedByDatsun theme. 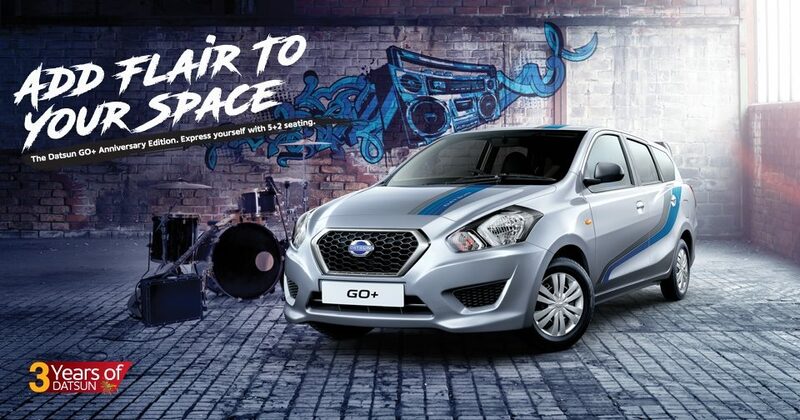 Datsun GO and GO+ are loaded with features like follow-me-home headlamps, speed sensitive electric power steering, powerful air conditioning, front power windows, universal mobile phone holder, auxiliary-in and USB charger ports, and central locking and full wheel covers. Both models come with a two year/unlimited kilometres warranty with Free Road Side Assistance. The warranty can be extended up to an industry-leading five-year/unlimited kilometres with Free Road Side Assistance, making Datsun the first manufacturer to provide unlimited mileage coverage under the extended warranty. To know more about Datsun India, log onto the Datsun website, Twitter and Facebook.